A new child care experience can be overwhelming. The topics below will help you prepare your child for this experience and help you establish a good working relationship with your child care provider. Some children adjust to a new child care situation almost immediately, others might take several months. Follow your child’s lead. Give them the time they need to adjust. Here are some tips to ease their anxiety. • Act positively about this new experience. Your child will pick up on your feelings. • Plan a few short visits before you begin full-time to help your child ease into this new experience. possible on your pick-up time. • Say good-bye the same way each day. Sneaking out is not advised. Explain that you are leaving and when you will return. It is common for a child to cry or fuss when you leave. To feel more at ease, call for a status report when you get to work. • Take time each day to talk with your provider about your child’s daily schedule, sleeping routines, eating habits, etc. • Ask your child to describe the events of their day. Note things they enjoyed and things that were stressful for them. • Make sure your child gets proper rest and nutrition. New experiences can be exhausting. • Read stories to your child that deal with feelings and new surroundings. • Ask if your child can bring a favorite toy, blanket, or family photo with them. Knowing that item is in their cubby or close by can help a child feel more secure. • Set aside a few minutes at the beginning or end of each day to talk with the caregiver about your child’s day. • Discuss concerns as they arise and negotiate solutions as soon as possible. • Share information about family events that may impact your child’s behavior such as a move, changes in sleeping or eating habits, exposure to a contagious disease, or the death of a family member or pet. 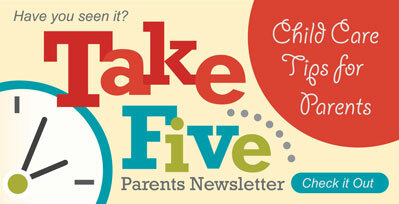 • Give advance notice of changes in your child’s schedule. Call if you are running late and make arrangements in advance if you need to arrive early. • Show appreciation and respect for your child care provider’s profession and the service they provide to your child, family and community. • Dress your child appropriately for their day, including warm and cold weather clothing items they will need for outdoor play. • Provide and restock changes of clothing, diapers, formula etc. as requested. • Return signed permission forms promptly. • Follow healthy practices when diapering and preparing food to prevent the spread of germs and infections. • Disinfect/sanitize toys and equipment on a regular basis and do routine cleaning to maintain a safe and healthy environment. • Wash their hands before food preparation, before and after diapering or toileting a child, after wiping a runny nose, and after handling pets, etc. • Oversee children’s hand washing as they start their day in the child care setting, after toileting, and before meals. • Distribute illness policies to all families upon enrollment and enforce illness exclusion policies. • Alert other parents if a child in the program has been diagnosed with a contagious disease. • Assess your child for signs of illness before they arrive at child care and arrange for alternate care if the child is ill.
• Be available to pick up your child if they become ill during the day and cannot stay at child care. • Keep your child’s immunizations current and provide updated documents to your provider. • Report contagious diseases to your child care provider within 24 hours of diagnosis. • Work with your child’s doctor and child care providers to develop a care plan for children with special health needs.